​Ourania was the Greek goddess of Astronomy, a daughter of Zeus and one of the Younger Muses. ​Ourania is one of the nine Younger Muses, daughters of Zeus and Mnemosyne; Zeus having visited Mnemosyne on nine consecutive nights. In addition to Ourania, the other eight Younger Muses were; Calliope (Beautiful voice), Clio (Celebrate), Erato (Beloved), Euterpe (Giving Much Delight), Melpomene (Celebrate with Song), Polyhymnia (Many Hymns), Terischore (Delighting in Dance), and Thalia (Blooming). Ourania inherited the beauty of her mother, as did the other Muses, but in ancient depictions, Ourania was distinguished by the fact that she held a rod pointing to a celestial globe. ​Just as Ouranus is often referred to as Uranus, so Ourania is also referred to as Urania, but the name means the same in either case, for it is most commonly translated as “Heavenly”. It is logical, therefore, that Ourania is the Muse of Astronomy. The link to astronomical readings also ensured that it was said that Ourania had prophetic abilities. The role of Ourania in Greek mythology though was one of inspiration, inspiring man to strive in artistic and scholarly endeavour. ​Additionally though, Ourania and the other Younger Muses would entertain other gods, to sing, dance and retell stories, especially about the greatness of Zeus. 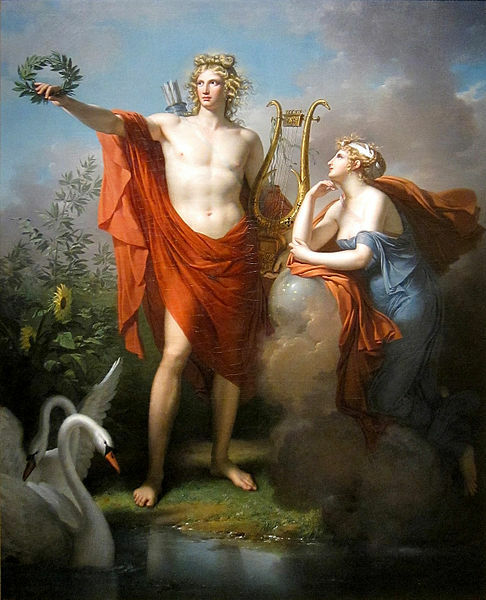 Thus, whilst Ourania was said to reside with the other Muses upon Mount Helicon, much of the time of the goddess and her sisters was spent upon Mount Olympus, where they were commonly found in the company of Apollo and Dionysus. ​In ancient texts Ourania is named as mother of two sons, the mythical bard Linus, potentially fathered by Apollo, and the god Hymenaeus, again potentially fathered by Apollo. There is no certainty though that Ourania was mother of either Linus or Hymenaeus, for both were named in ancient texts as sons of other Muses.